After briefly considering public cloud computing, many companies are opting for private models instead. 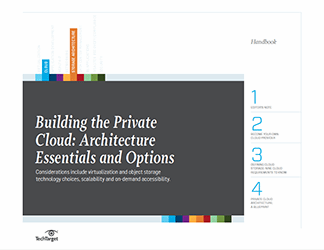 This expert IT handbook provides an in-depth overview of private cloud computing and offers exclusive advice to help companies make the move from virtualization. Discover the importance of performance monitoring and capacity planning and learn how you can keep track of resource usage by implementing chargeback. In this handbook, we'll answer all your important private cloud management questions, and get advice from our experts.